An ancient star has been found lurking in the “forbidden zone” of star formation, which has astronomers puzzled as to how it could have formed. Astronomers used instruments on ESO’s Very Large Telescope (VLT) to observe the star, which is called SDSS J102915+172927. It has slightly less mass than our Sun, and could possibly be around 13 billion years old. Stars are composed mainly of hydrogen and helium, with a small amount of heavier elements. These heavier elements are referred to as “metals” by astronomers, but surprisingly this mysterious star is almost devoid of them. In fact, it has 20,000 times less metals than the Sun. 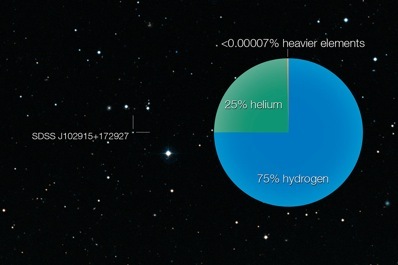 This image shows both the ancient star SDSS J102915+172927 and a pie chart diagram indicating its unusually low abundance of elements heavier than hydrogen and helium. Image: ESO/Digitized Sky Survey 2. The Sun is part of a group known as population I stars, in which metals typically account for two to three percent of the star’s composition. Older stars – population II – have considerably less metals, ranging between 0.01% and 0.1%. A third, more elusive type of star dubbed population III are predicted to contain no metals whatsoever and be extremely massive. Due to their immense size, they would have burned out quickly when the Universe was still young and thus they have never been observed. Stars can only form from cool molecular clouds; if they are too hot then they will keep expanding, unable to collapse into stellar nurseries. During the big bang, hydrogen and helium were created along with trace amounts of lithium. With only hydrogen and helium available in significant quantities, the earliest molecular clouds were solely cooled by molecular hydrogen. However, molecular hydrogen can only cool the clouds to a certain point, at which only massive stars around 100 times more massive than our Sun can form. These were the population III stars. When these population III stars died in dramatic supernova explosions, the surrounding interstellar medium was enriched with metals which had formed within the stars as they evolved. These metals, particularly carbon (C) and oxygen (O), are much more efficient at cooling molecular clouds. Cooler molecular clouds can fragment into smaller clumps, which allow smaller stars to form. The paucity of metals in this star brings it very close to being a population III star. “But to explain the presence of a small amount of metals, it has been formed from material contaminated by the ejection of at least one massive star. Therefore it is at least a second generation star,” says Caffau. Caffau and her team expect to find between 5 and 50 similar metallicity stars with the VLT in the future.